DICE makes up for a lack of updates with the announcement of one gigantic mega-patch on the horizon. Gamers can be very particular when it comes to the mechanics of online play. Sometimes even a 1% adjustment to a weapon or player class can be the decisive change that fundamentally alters the outcome of a match (at least the players seem to think so). Because of this delicate balance, most multiplayer aficionados prefer, if not demand, that developers stay on top of the more popular franchises after release, tweaking and fixing the game until everything achieves some semblance of equilibrium. That's why, recently, a large segment of the Battlefield 3 community has begun to wonder why many of these concerns haven't yet been addressed in their game of choice. Perhaps in response, or perhaps by coincidence, DICE has suddenly revealed a mammoth list of upcoming fixes, tweaks, and balances that players can expect to experience for themselves somewhat soon. -The Hip Accuracy bonus provided by the Laser Sight has been increased. -The Suppressor no longer reduces the maximum damage of a weapon when equipped. Instead the Suppressor reduces the minimum and maximum range of the weapon, making it ideal for CQB and Stealth. "We would like to share some of the confirmed fixes and tweaks that we have been working on to the community," wrote Daniel Matros, DICE global community manager for the official Battlefield blog. "Note that this is still not a full update list and there will be more information on this as we go forward. Also please remember that the content in this list might be changed but of course, we will also keep you in the loop about this. While there still is no ETA on the patch, we're still working on improving online gameplay for all of our dear community members." 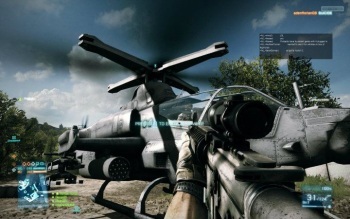 While DICE doesn't yet know exactly when players will see this mega-patch, it did confirm that it will be for all versions of Battlefield 3, including PS3, Xbox 360, and PC. The only version of the game likely not receiving the patch is Aftershock, though somehow I doubt anyone will notice.